Event space is indoor, do not worry raining! 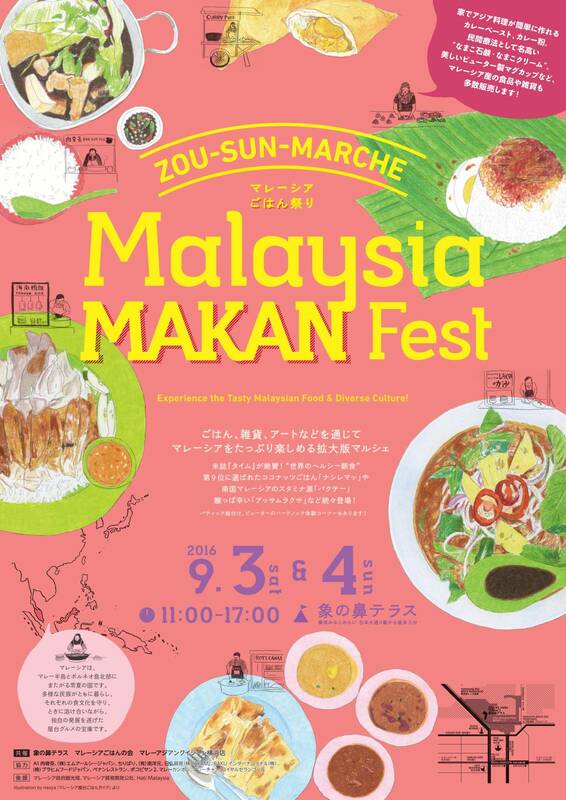 Please join this event, Let’s eat Malaysian food and sharing Malaysian culture at Malaysian MAKAN festival in Zou-no-hana-Terrace(Yokohama). Food Menu : Asam Laksa, Bak Kut Teh, Nasi Goreng, Ayam Goreng, Befun Goreng, Char Kway Teow, Roti Jala, Nasi Lemak, Chicken Rice, Ayamas Roasted Chicken, Beef Rendang, Kari Pop, Satay, Bubur Chacha, Kuih Seri Muka, Kuih Pulut, Teh Tarik, Asamboi .. and etc..
Products：Pewter products, Gamat products, Gadis Manis T-shirts, Adabi Curry powder, Babas Curry Powder, AYAM products, Brahim products, Kaya Jam, Chili bali, plate… and etc.. total 100 kinds of product! !